Cartwright Conversions’ Head of Manufacturing has won an award from LEX Autolease for Customer Service for the outstanding levels of service provided to Lloyds Banking Group’s new fleet of mobile bank branches. Jason Barker leads a team who have converted 49 Iveco Daily vans into mobile branches both for Lloyds Bank and its subsidiary Bank of Scotland which are now in use from one end of the UK to the other. As well as meticulously carrying out the conversions at Cartwright Conversions’ base in Doncaster, Jason and his team provide a 24/7 support service UK-wide to ensure the vehicles perform to their optimum capabilities. 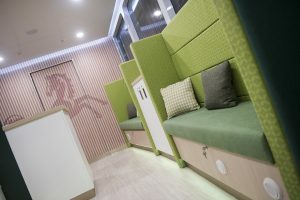 The finished mobile branches, complete with comfortable waiting areas equipped with sofas (pictured right), are supplied to the banks through LEX Autolease, another part of Lloyds Banking Group, which has now honoured Jason. He was presented with an engraved glass trophy at a gala dinner organised by LEX Autolease in Cheshire which he attended with Steve Shaw, Managing Director of Cartwright Conversions. Jason said: “I am delighted to have received this award – it makes all the hard work worthwhile! And of course it reflects the hard work of everyone on the production team, I couldn’t have done it without everyone behind me. “The mobile bank conversion was one of our more technically challenging projects, it involved liaising with a lot of different stakeholders and has been re-designed along the way to allow banks to offer more services. From the outset Cartwright Conversions worked closely with the banks, LEX Autolease, BT and G4S which operates the vans. Prototypes went on the road late in 2016 and the design was adjusted in response to customer feedback. The vehicles were first rolled out in remote, rural areas where access to banking has traditionally been difficult and then to small towns where banks no longer have a physical presence. Initially offering basic services, they proved so popular that the range of services was extended. Cartwright Conversions is part of Altrincham-based Cartwright Group, which in recent years has expanded beyond being the second-largest manufacturer of trailers in the UK to become a true one-stop shop for trailer needs, with thriving rentals, fleet services and finance operations. It has diversified into conversions and into aircraft ground support equipment. Since being established Cartwright Conversions has grown to have a staff of 75, including apprentices, and is renowned for its conversions to blue-light vehicles, welfare vehicles for remote workers, and ambulances. Planning permission on Cartwright’s new premises has just been granted to allow for the redevelopment and extension of the site at Belton in North Lincolnshire.